James Street North has been just a little louder every Friday lately, or more accurately, for the past six years. It is all thanks to The Mulberry Street Porchin’ Band. The six-piece band’s raw, classic rock sound can be heard from their very front porch all the way down Mulberry Street off James Street North, putting a smile on the face of any pedestrian that seems to linger in front and around the house. The Silhouette was given the opportunity to sit down with three members of the band this past week to dig deeper into their story. Speaking was Ian Linton (bass/vocals), Ritchie Woodward (drums/vocals), and Guy Wilkes (guitar/vocals). The group first began with an open call for local musicians. “I answered an ad in Kijiji. They were looking for players…that’s where I met all these people,” Linton answered. Although the band plays until it’s considered disrespectful to the neighbours, The Mulberry Street Band has a total of only four original songs that they enjoy playing. The rest of the time is spent covering old, classic rock songs by legendary bands we all know and love. However, Woodward talked about an original song he wrote in five minutes which is all about his trip down to Texas to visit family. “It’s just an inside joke. It was just for my sister, but it’s my favourite song to play.” Woodward smiles. Two of their songs titled “Diggin’ A Hole” and “Playtime’s Over” were both written by Dukic and Woodward and are frequently played on Friday nights, while the original song by Ian Linton was written as “more of a commercial thing,” according to him. 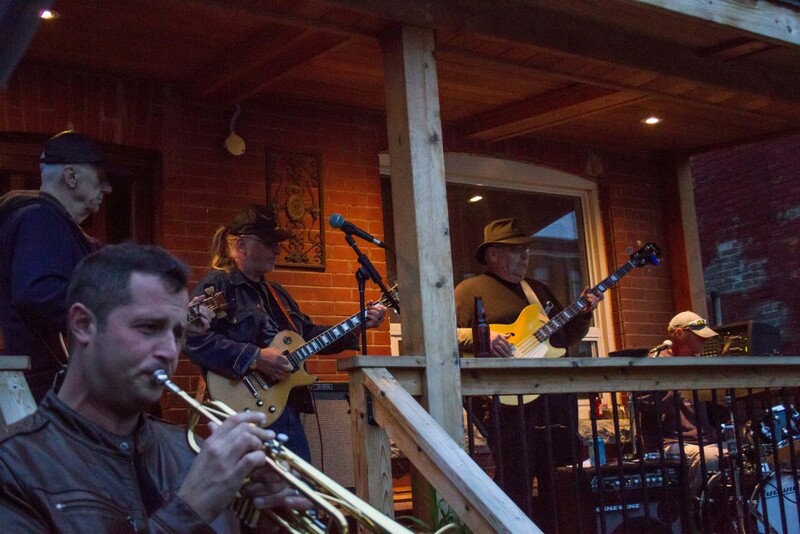 The Mulberry Street Porchin’ Band have been in Hamilton for the last decade, and as a result has become a part of the ever-growing art scene on James Street North. They have become part of the Friday routine for locals, and were personally able to witness the street transform into something more and more beautiful day by day. “I’ve seen this street grow. I played on James Street North when the International was a hotel… so I’ve seen a lot of changes on this street and it’s really, really great to see it come alive like this. And the youth coming in, that’s the big thing that I see. That’s improved the street so much,” Linton said with a smile. The band hopes that they will be a part of their local art scene for the foreseeable future. “Until we can’t. Or someone makes us stop… We’ll continue this forever… we love this,” responded Woodward. There is no end in sight for the local favourites. Dedication is obvious just by their stage presence. The group loves to entertain the neighborhood, and they feed off of their audience’s excitement in the midst of another classic song. The Mulberry Street Porchin’ Band will continue to play on Mulberry Street every Friday starting at six o’clock. As they eventually plan on recording a CD for next summer, they will still be livening up their favourite neighborhood for the remainder of the fall season.